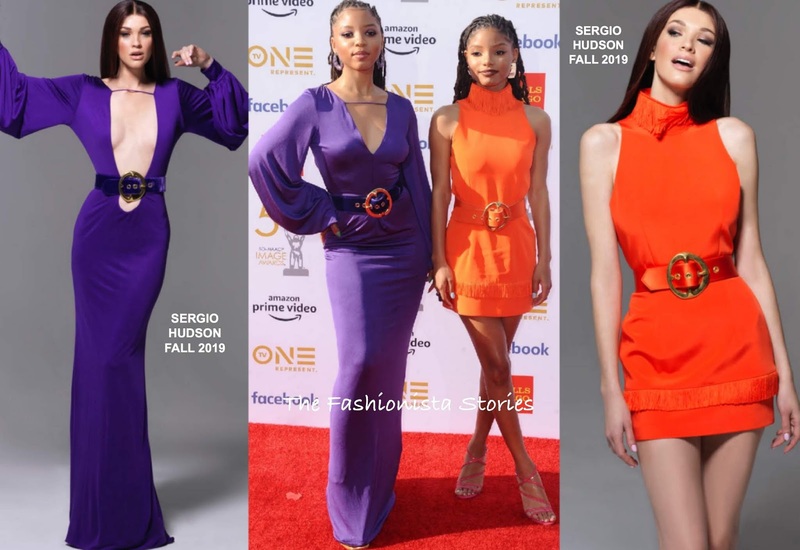 Sister duo Chloe x Halle rocked coordinated SERGIO HUDSON FALL 2019 looks on the red carpet yesterday evening(March 30th) at the 50th NAACP Image Awards at the Dolby Theatre in Hollywood, California. Chloe Bailey wore a purple long sleeve belted dress, that gazed the floor. She changed the neckline which did not work in her favor. I prefer the dress as is in the look book and the altered neckline does not work. I think the bodice should have been changed to a crewneck to compliment her look. Halle Bailey wore a vibrant orange, sleeveless mini dress, with a turtleneck and belted waist. Her dress works but I just wish it was fitted on the waist. Both sisters finished up with flawless beauty looks. What do you think of Chloe x Halle's Sergio Hudson looks?